Here is the second instalment of my recommended books for older readers. You won’t find board or picture books here but you WILL find entertaining junior and middle grade fiction right through to YA and Adult. 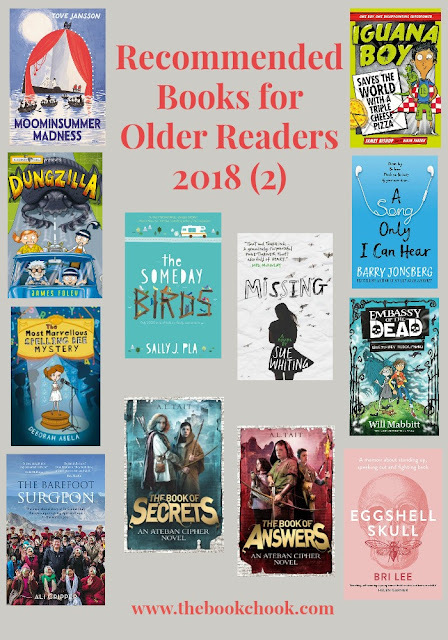 For the first instalment, see Recommended Books for Older Readers 2018. Moominsummer Madness is a children's novel by Tove Jansson, published by Profile Books (Allen and Unwin in Australia) (2018.) RRP: $Au 19.99 HB. I was introduced to the Moomins only recently in Finn Family Moomintroll, and found this novel equally as charming. It’s a special collector’s edition which the publisher describes as being “lovingly restored to its original stunning design.” Never having seen the original, I can only tell you I loved the slipcover, the fold-out map and the charming black and white illustrations. This is a classic which will beguile children of today just as much as it did earlier generations. The Someday Birds is a children’s novel written by Sally J. Pla, with illustrations by Julie Mc Laughlin published by HarperCollins (2017.) RRP: $Au 34.99 HB. The Someday Birds is a debut middle grade novel perfect for fans of Counting by 7s and Fish in a Tree, filled with humor, heart, and chicken nuggets. A road trip is a great vehicle for families to make discoveries - about their surroundings and about each other. When Charlie’s brain-injured father is taken hundreds of kilometres away to a special hospital in Virginia USA, the children set off to follow him. Charlie is the main character, a likeable, strong point-of-view character with some obsessive behaviours - lack of hygiene makes him fell physically ill so that he MUST wash his hands 12 times, and he mostly survives on chicken nuggets. He is intelligent and a skilled artist. He shares a love of birds with his dad, and is convinced that Dad will be comforted if Charlie can see and check off the birds on their Someday Bird list. I loved looking at the world through Charlie’s eyes. Pla has a real knack for making us appreciate the humour inherent in his life, without in any way laughing at him. I know kids will enjoy the humour in this novel, but I think they will enjoy the drama and the tension as well. It’s 300+ pages and the illustrations are chapter headers, so I would recommend it to capable readers 8+ who like realistic fiction with lots of humour and family situations they can recognise. Read a sample via HarperCollins website. Missing by Sue Whiting is a middle-grade novel for children 10+ published by Walker Books (2018.) RRP: $Au: 17.99 PB. I have previously reviewed Whiting’s Taming Butterflies and Dance of the Sugar Plum Fairy. Missing is a novel that will sweep kids up and rush them headlong into a world etched in drama and suspense. Whiting uses just enough detail to put us in the middle of the action, whether that’s in a Sydney shopping centre or a jungle in Panama. There’s a mystery to solve and Whiting allows us to work it out alongside the young teen protagonist. Mackenzie is a great character. I loved seeing the world through her eyes. Whiting cleverly reveals Kenzie’s chaotic thoughts and feelings by showing us rather than telling us all about them. We are caught up in the pain of a girl who is trying to hold it all together while not really knowing who to trust or what to believe. Yet all the while Mackenzie perseveres and does her best - qualities kids will understand and relate to. The ending is believable, not fairy-tale but very satisfying. The Most Marvellous Spelling Bee Mystery by Deborah Abela, published by Penguin (2018.) RRP: $Au 14.99 PB. I have previously reviewed The Stupendously Spectaular Spelling Bee by Abela. Abela has also written an interesting article for young writers here at The Book Chook: Lucky You! You Want to be a Writer! Just when India Wimple’s life is returning to normal after competing in the Stupendously Spectacular Spelling Bee, she’s invited to London for an international spelling showdown. But how can she go without her family? The Yungabilla community might have a solution! India is one of those great characters who wins your heart and stays with you. We meet some old friends and fascinating new ones too in this jaunt to the International Spelling Bee in London. Of course, as in all good stories, there are twists and complications, and there are problems to solve and a villain to defeat. Each chapter is headed by a text box with a word and its definition. The words are chosen carefully and serve as an introduction to the chapter’s focus, which is one of many touches I appreciated in this novel. My inner nerd hopes that this book succeeds in promoting spelling and vocabulary knowledge as cool activities as well as necessary skills for all who want to communicate effectively. If children have read The Stupendously Spectaular Spelling Bee, then The Most Marvellous Spelling Bee Mystery is a must-read, but it can also stand alone quite well. Kids who enjoy solving problems will relish this book. Kids who look for “something funny” will definitely find it here in Abela’s spot-on descriptions of life in our society, and adore the often slap-stick humour. Above all this is a feel-good story with a universal appeal, and I believe it will fly off library shelves. The Book of Secrets: The Ateban Cipher Book 1 and The Book of Answers: The Ateban Cipher Book 2 are both novels by A. L. Tait. I have previously reviewed Tait’s The Mapmaker Chronicles. The Book of Secrets: The Ateban Cipher Book 1 is the first novel in this series by A. L. Tait, published by Hachette (2017.) RRP: $Au 14.99 PB There are teacher notes to accompany the novel. What's the secret of the book, and why is it so valuable? These are the questions Gabe must answer when a dying man hands him a coded manuscript with one instruction: take it to Aidan. Gabe is hurled into a quest that takes him beyond his monastery home and into a world of danger, political intrigue and adventure. As he seeks to decipher the code and find a mystery man who may not even exist, Gabe learns that survival must be earned and that some of life's biggest lessons are not found in books. Gabe finds himself questioning everything he knows about right and wrong and wondering if he'll ever find a way back home. He also discovers that the biggest secret of all may be his own. As Eddie seeks to regain his crown, and Merry and Gwyn race to free their father, Gabe will discover the answer to his own great mystery - his true identity. Both novels are action-packed, with problems to solve, humour to enjoy and heroes to admire. I loved that the protagonists are such an interesting and diverse bunch. Gabe is just as you would expect for a young teen brought up in a monastery. He’s lacking in worldly wisdom, is not strong or fit, and although he can read, write and sing like an angel, those are not skills much needed when you’re fleeing an enemy. Luckily he meets a band of all-girl - thieves? bandits? maybe rule-breakers would be the best description. Merry, Gwyn, Scarlett and Midge surely must have been inspired by Robin and friends, and I know girl readers in particular will be thrilled to read about their exploits. I would recommend this two-book series to kids 8+ who want a gripping read that will entertain them, a book that will transport them to a place far away that’s full of adventure, danger and mystery. I believe these are books that will equally please boy and girl readers, and hope they will enjoy them as much as I did. Dungzilla by James Foley, published by Fremantle Press (2017.) RRP: $Au 14.99 PB. I have previously reviewed Foley’s The Last Viking, The Last Viking Returns and In the Lion. Sally Tinker – the world’s foremost inventor under the age of twelve – has built the incredible resizenator. But when Sally accidentally enlarges a dung beetle to enormous proportions, she finds herself with a monster problem! Can Sally and her friends save their town from being crushed by a giant poo ball? I know plenty of kids who will be attracted by the title and then overjoyed to see Dungzilla is a graphic novel. The story will also appeal to kids who love to invent things, those who grin when they see ANYTHING about poo, and the many many kids who want a book to entertain. Dungzilla does! The story rollicks along at a tremendous pace with lots of visual and textual humour. Fun words like “embiggenated” and “shrinkafying”, quirky characters, building tension, lots of appealing graphic elements, and illustrations that are full of action and emotion contribute to a reading experience impossible to forget. This is a great book to recommend to those kids who are not yet switched on to reading novels. It will very much appeal to children who love quirky cartoons and visuals. Teachers will enjoy the focus on science and making. Parents will wonder if anything that makes kids laugh THAT much could bust a rib. And librarians will immediately start thinking of just the right hands to get it into! There are teacher notes on Fremantle Press's website. Iguana Boy Saves the World with a Triple Cheese Pizza is a children’s novel by James Bishop, illustrated by Rikin Parekh, published by Hachette Australia (2018.) RRP: $Au 14.99 PB. Which of us hasn’t wanted superpowers? I know I do. (Although I do have problems imagining my own superhero costume!) But what would happen if you actually got a superpower and it turned out to be rubbish? Grab your sense of humour and suspend disbelief as we meet…Iguana Boy! Blessed with the rare but not-so-cool ability to be able to speak with iguanas, poor Dylan needs to come up with a plan to defeat a super villain and save the day. Oh yes, and it has something to do with cheese pizza. This is definitely one for your kids who like humour, wacky plots and crazy characters. It makes a great suggestion for children who love comics too - the occasional comic style illustrations really contribute to the general zaniness and jokey atmosphere. Even kids who are not quite sure if they actually like books or reading will be intrigued by the title, the vibrant cover and the promise of meeting a bunch of iguanas, all called Paul. I would recommend it to kids 7+ who want a wild ride of a read. Embassy of the Dead Book 1 is a novel by Will Mabbitt, with illustrations by Chris Mould, published by Hachette (2018.) RRP: $Au 14.99 PB. The first book in a spookily funny new series, where the living meet the dead and survival is a race against time. Perfect for fans of Skulduggery Pleasant and Who Let the Gods Out. When a ghost gives you a box, my advice would not not to open it. AT ALL. Sadly, few of us listen to advice. Readers will guess as soon as Jake discovers the human finger that things are about to get tricky, and so it proves. With the help of his “deadly gang” - they’re dead, anyway - Jake must find the Embassy of the Dead and seek protection. But with a 7.3B Death Order in his name, will Jake find it? Embassy of the Dead is a good book to recommend to children who like a series, but they need to be prepared for some nastiness, a spoonful of spooky, and a thrill or two. I think I would suggest it to kids year 4 and up, and make sure they are brave! The illustrations are few, but excellent and creepy, and there are also graphic elements that add to this novel - like the odd skull, atmospheric chapter headings and even an excerpt from The Book of the Dead. Read it if you dare! A Song Only I Can Hear is a YA novel by Barry Jonsberg, published by Allen and Unwin (2018.) RRP: $Au 29.99 PB. I really enjoyed Jonsberg’s My Life as an Alphabet, especially its main character, Candice Phee. In A Song Only I Can Hear we meet Rob Fitzgerald, 13, painfully shy, prone to panic attacks and keen to impress the girl of his dreams, Destry. When an anonymous tester sets challenges for Rob so that he will learn to value himself, the scene is set for hilarious consequences. Jonsberg’s eye for telling detail, his characters’ wry observations, and the almost slapstick comedy scenes in the book make it a really fun read. The Barefoot Surgeon is a book by Ali Gripper, published by Allen and Unwin (2018.) RRP: $Au $32.99 PB. Inspiring and uplifting, this is the extraordinary the story of Dr Sanduk Ruit who, like his mentor Fred Hollows, took on the world's medical establishment to give the life-changing gift of sight to hundreds of thousands of the world's poorest and most isolated people. It is the story of a boy from the lowest tiers of a rigid caste system who grew up in a tiny, remote Himalayan village with no school to become one of the most respected ophthalmologists in the world and a medical giant of Asia. Compelling and compassionate, it is also the story of a young doctor who became Fred Hollows' medical soul mate and who chose to defy the world's medical establishment and the lure of riches to make the world a better place. I know there are many readers who look for books that will educate and inspire, not just entertain. Dr Sanduk Ruit is an eye surgeon who has followed in the steps of Australian doctor, Fred Hollows. He has restored sight to over 120 000 people! And all this in some of the most difficult terrains in the world. He packs his mobile surgery and travels to remote villages. There he truly changes people’s lives. Gripper is a journalist who travelled to India, Nepal and Bhutan for three years to watch Doctor Ruit working, and to interview him. She writes in an easy conversational style that I believe reveals her tremendous admiration for Ruit. Eggshell Skull by Bri Lee, published by Allen and Unwin (2108.) RRP: $Au 29.99 PB. Eggshell Skull is a memoir, but so much more than that. It is the intensely moving, raw and personal story of Bri Lee who is courageous enough to confront her past and also reveal the present, with all its injustices. Lee writes with the kind of observations and details that help you make connections with her, and with the book as a whole. Teacher by Gabbie Stroud. Review here. Find more Book Reviews on The Book Chook by clicking Reviews in the right sidebar.